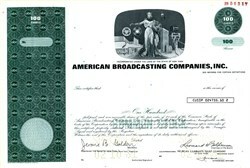 Beautifully engraved SCARCE SPECIMEN certificate from the American Broadcasting Companies, Inc. This historic document was printed by the Security-Columbian Banknote Company and has an ornate border with a vignette of an allegorical woman holding a globe next to an old broadcasting camera and video tape reels. There is also "ABC" imprinted in the border. This item has the printed signatures of the Company�s President and Founder, Leonard Goldenson. Punched "Specimen" no later than 1981. Leonard Goldenson was born in Scottdale, Pa., on Dec. 7, 1905. Leonard Harry Goldenson was the son of Lee and Esther Broude Goldenson. Lee Goldenson was a clothing store proprietor in the southwestern Pennsylvania town, and had an interest in the local movie house. After graduating from high school in Scottdale, the younger Goldenson attended Harvard College and Harvard Law School. But when Goldenson emerged from Cambridge, Mass., in 1930, the nation was immersed in the Great Depression, and work was hard to find. For a year, Goldenson worked as a law clerk to a railroad attorney, then joined a large law firm. One of the partners there was an attorney for the trustee of the then-struggling Paramount Pictures Inc. In 1933, Goldenson launched his career in motion pictures as an attorney for Paramount. Five years later, he was responsible for Paramount�s 1,700 movie houses across the nation. While head of Paramount�s theater division in 1951, Goldenson heard that the American Broadcasting Company � the former Blue network of NBC plus a few television stations � was for sale. Goldenson bought ABC�s five owned stations, eight affiliates, and radio stations and merged it with United Paramount Theatres. His marriage of television and motion pictures helped transform television from a novelty to the powerful medium it is today. And it helped make an industry leader out of a struggling company. At the time of Goldenson�s purchase, ABC was No. 4, behind CBS, NBC, and the now-defunct DuMont network. A turning point in the growth of the fledgling ABC Television network came when Goldenson negotiated an exclusive contract with Walt Disney. Goldenson invested in the California theme park and got 26 one-hour programs for ABC. When the Disneyland show went on the air in October 1954, it quickly became a top 10-rated program. Information from ABC Press Release.